The Twinshock Shop offer a variety of services to the customer. Find out all about them here. We offer advice and guidance to all classic trials enthusiasts, so please contact us if you need help. All work is carried out in large and secure unit, so you know your pride and joy is safe whilst being worked on. Please contact us to arrange motorscyle deliveries on 07817 667565. 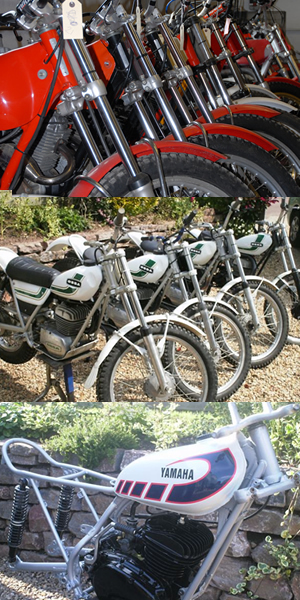 We restore all twinshock trials motorcycles ourselves to a very high standard. Here at the Twinshock Shop we also undertake all kinds of restoration work to customer requirements. Whether you want your bike back to original or make it into a real one off eye catching show piece, we can help. We can modify frame steering angles to improve handling on all trials models. For any restoration work please contact us.